Intelligent hair styling includes products specially designed to withstand high temperatures and protect hair from heat. We want to have straight hair, if the Mother Nature gave us curls, and we want curls, if born with straight hair. So, in this race for a perfect style we use hairdryers, straighteners and curling irons, sometimes a few times a day. Thus, it’s crucial to use proper products to protect our hair from thermal damages. Frequent Washing. Shampooing too frequently is harmful for hair. Shampoos may remove natural protective oils from hair and scalp, as a result – dull and dry hair. Solution: use a dry shampoo in between washing’s. In addition, carefully select your shampoo and conditioner, formulated for gentle cleansing and protection. Towel Drying & Brushing Wet Hair. Wet hair is more sensitive to damages. When hair gets wet, its core bloats, so hair becomes more elastic and easy to break. Rubbing or brushing damp hair can also rough up the cuticle, causing frizzy and fluffy look. Solution: Be gentle and blot your hair with a towel instead of rubbing it. Use a wide-tooth comb to remove tangles. Weather conditions. The cold air, sun rays, strong wind and air-conditioners, can compromise the integrity of our hair. Solution: Apply a leave-in spray or conditioner with proteins, amino acids and natural oils to protect your hair from environmental factors. Blow drying, straighteners & curling irons. The biggest damage hair gets from our styling habits. Without the heat protection, styling tools can dry out the hair and the heat load can damage the cuticle layer. Furthermore, dehydrated cuticle may crack, leading to breakage, frizz and split ends . Solution: Of course in our modern lifestyle, it is almost impossible to air-dry hair and don’t use any irons on it. Therefore, we have to use a high performance heat protection products and smart styling devises to minimise the damage. Recently, I discovered a new line NEURO from PAUL MITCHELL®. New products contain the innovative HeatCTRL® technology. This complex of active ingredients is activated by heat, forming a protective barrier around the hair and protecting it while using heat tools. 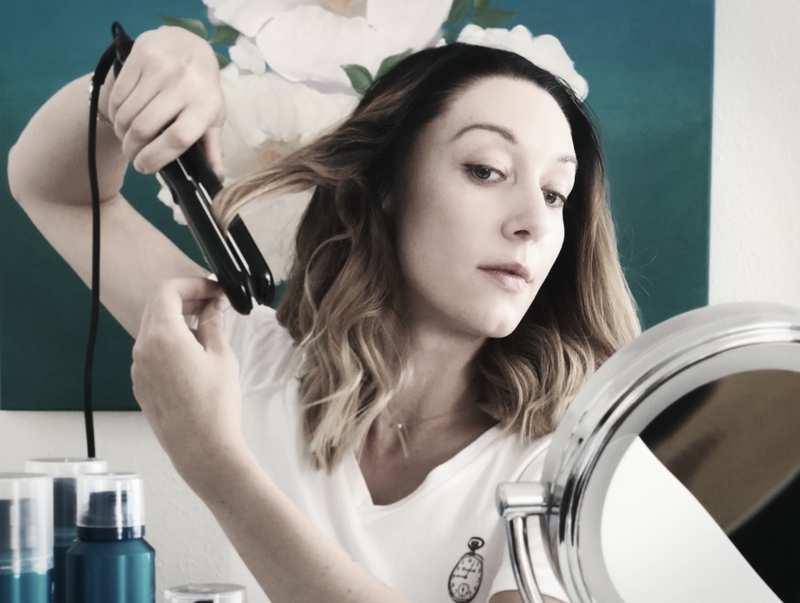 I tried the complete line of seven products, and I think these are very effective and comfortable styling products with ultra-high protection and care. Just the right tools for my daily hair styling routine. Below, you will find details about them. LATHER / HEATCTRL® SHAMPOO for a soft and gentle wash. The formula is safe for all colors and hair types. LATHER / HEATCTRL® CONDITIONER protects the cuticle and regenerates heat-stressed hair and makes it soft, supple and easier to style. REPAIR / HEATCTRL® TREATMENT repairs heat-damaged hair and smoothes the cuticle layer. I use it as a mask once or twice a week. PRIME / HEATCTRL® BLOWOUT PRIMER is a leave-in primer, that prepares hair for the hair styling and protects it from the heat damage. I apply it after each washing on damp hair. LIFT / HEATCTRL® VOLUME FOAM gives a lot of volume when blow-drying, at the same time protecting hair from thermal-damage. PROTECT / HEATCTRL® IRON HAIRSPRAY brings optimal protection during heat styling, provides long-lasting hold and brilliant shine. In addition, the spray is resistant to humidity and prevents frizz. I like its light texture, while applying my hair doesn’t get wet and ready for styling right away. I use the protection spray every time before styling with straightener or curling iron. FINISH / HEATCTRL® STYLE SPRAY provides comfortable long hold. Also, it helps to protect against humidity and frizz. Important part in keeping hair healthy is to use correct styling tools, that allow to control the heat and airflow. My latest discovery is Neuro Smooth Flat Iron. It’s a smart iron for straightening or curling. It has great innovative features for professional and safe hair styling. So I am happy to share with you these functions that really make a difference. Heats up to 230°C in 30 seconds. Adjustable temperature control for fine, normal or thick hair, as well as the highest 230°C professional setting. SmartSense microchip regulates temperature 50 times per second. 3.17 cm wide IsoTherm titanium plates, for fast and even heat. Customizable auto shut-off (1 – 120 minutes). Dual voltage (110 V-240 V) for worldwide use. I think, this iron is a great addition to every girl’s hair styling collection. It is so easy to damage our beautiful hair trying to achieve a perfect style, but it is so hard to recover once the damage is done. For that reason, we should provide a proper care and protection, so our hair will be healthy, smooth and shiny for many years. You are welcome to share your favourite hair styling products and experiences in the comments below. Stay tuned for more beauty novelties and news on World of Julia.